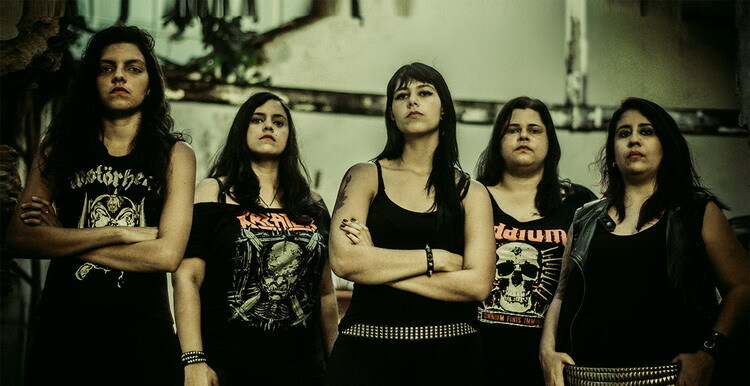 VOCÍFERA is formed back in 2011 in Recife (Brazil), when two young girls inspired by such bands as KREATOR and OBITUARY decide to play the same kind of music. The first attempts result in composing of much more aggressive and tough material welcomed by local press and the girls determine upon a course of development of their combination of thrash and death metal. Following numerous hometown shows the band goes on the road, participates in many Brazilian festivals and shares stage with such monsters as KRISIUN, SODOM, TESTAMENT and CANNIBAL CORPSE. Encouraged by positive response to their self-titled demo recorded in 2012, VOCÍFERA decides to record a full-length album. During the recording process the band undergoes some line-up changes. Nevertheless "Evil Thoughts" is finished in 2016 and uploaded on the Internet. In the end of 2016 the debut is released on CDs (limited to 1000 copies) by the joint efforts of Russian labels More Hate Prod., Narcoleptica and Grotesque Sounds, and on MCs by Red Truth Records (Kazakhstan).